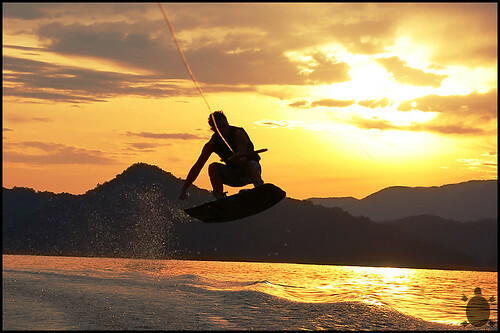 Wakeboarding is a sport that is rising in popularity in the US. Created out of a mixture of water skiing and snowboarding, this high octane sport sees contestants pulled along a body of water by a powerboat while attached to a board that is a cross between a snowboard and a surfboard. What are the top ten wakeboarding tricks and who created them? One of the classic stunts is the Tantrum, which in its simplest form involves an overhead backflip through the air. First created by Eric Perez, the Tantrum is now a stalwart of any wakeboarder’s arsenal of tricks. Once wakeboarders have mastered the Tantrum, it’s time to take on the Whirlybird. Created by Bill McCaffray, this trick is the same as a Tantrum except with an additional 360 degree turn and the handle held above the head. This is essentially a reverse cartwheel that is performed in mid air. The Heelside Backroll, again invented by Eric Perez, is a popular trick as it is one of the easiest to perform but still looks impressive. Similar to the Heelside Backroll, this trick involves performing a cartwheel in the air, although this time the wakeboarder flips forwards rather than backwards. Since this is a classic trick, it is not claimed by anyone. Another impressive looking trick that is relatively easy is the Half Cab Roll, which sees the wakeboarder spin sideways through a full 360 degrees before landing. This trick has been mastered most effectively by wakeboarding legend Parks Bonifay. This trick involves rolling forward through the air with an additional 180 degree turn added in. The Scarecrow was first created by Brannon Meek. After you have learnt the Scarecrow, you are ready to attempt the Elephant. This is the same as a Scarecrow but with a reverse 180 turn added. The credit for inventing this trick is generally split between Scott Byerley, Brannon Meek, and Gregg Necrason. The Crow Mobe is another trick that is best performed by those with experience of Scarecrows. This is a toeside frontroll with an additional 360 turn and was again created by Scott Byerley. The Tantrum to Blind is another stunt that should only be attempted by experienced wakeboarders. Essentially it is very similar to a Tantrum, although the boarder must perform an indy grab and a backside 180 to complete the stunt. This trick is the brainchild of Scott Byerley. One of the more difficult tricks to pull off is the Mobius, which includes a full 360 degree sideways spin with a 180 turn on the landing. The trick is hard to perform consistently well, which is why many wakeboarders do not attempt it in competitions. There are a few variations of the Mobius with one of the most well known, the Mobius 540, created by Jeremy Kovak. If you are new to wakeboarding you may want to research these tricks further before trying them out. They can be a lot of fun once you have them down, though! This entry was posted in Wakeboarding, Water Sports and tagged Top 10, wakeboarding tricks. Bookmark the permalink.